In any economy, it’s a good idea to save money. Since our books are already discounted, you save money by choosing Capitol Hill Books over a new bookstore. However, Capitol Hill Books has an even cheaper way to get your book jones on. 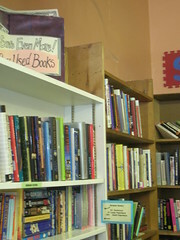 Our clearance corner has a wide variety of books in good condition for as little as $.50 to $2. And its good stuff too: lots of hardcover mysteries, and interesting nonfiction books. 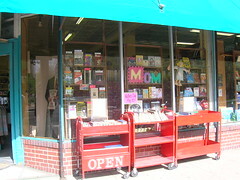 And if you just need a book but only got a tiny bit of dough, be sure to check out the carts we have just outside of the store. Paperbacks are only a quarter, and hardcovers just 50 cents. And since the money from those books goes to local nonprofits, you can feel great inside and out knowing that your book purchase is helping others in the community. This entry was posted in Uncategorized and tagged bargain, books, carts, cheap, frugal, photos. Bookmark the permalink.